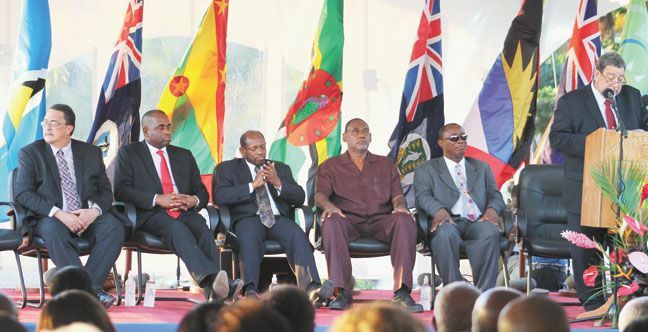 Caribbean Prime Ministers: "Bucc Bay is a wonderful resort." Buccament Bay Resort is honoured to be the venue for a meeting taking place this week for the Organisation of Eastern Caribbean States (OECS), which St Vincent & the Grenadines Prime Minister Dr. Ralph Gonsalves is chairing. Resort staff, particularly the many who were born and raised in St Vincent & the Grenadines, are extremely proud to host such esteemed guests. St. Kitts and Nevis Prime Minister, Dr. Denzel Douglas, was one such guest who had high praise for Bucc Bay and the confidence it shows in SVG and the Eastern Caribbean as a whole. Amongst the issues being discussed at this important meeting is the Argyle International Airport, St Vincent’s new international airport that is scheduled to open in late 2013/early 2014, thus allowing for direct flights to the island.